Many people these days suffer from the trauma of premature graying of hair. Hair grow from hair follicles that are deep seated in the outer layer of the skin. There are oil glands of scalp that secrete and oily substance known as sebum. This sebum gives nourishment to hair and gives it its shine and color. 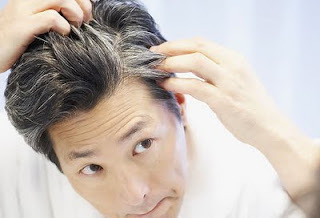 When oil glands do not produce enough sebum, it causes premature greying of hair. Read on to get natural herbal remedies to control premature graying of hair! deficiency of B-complex vitamins, iron, copper and iodine. Long term cold, sinusitis or constipation. Eat a balanced diet. Include sufficient amounts of cereals, pulses, milk, fruits, green leafy vegetables and a small helping of liver every week (if non-vegetarian). If needed, take B-complex vitamin supplement. Consult your doctor for this. Do ‘yoga’ and meditation for getting rid of mental worries. Take a good amount of curry leaves. Boil them in coconut oil. Strain and let it cool. Massage the scalp with this oil regularly. Take a few pieces of ribbed gourd. Dry them in sun. Then soak these dried ribbed gourd in coconut oil for about four to five hours. Boil the oil till the pieces in it become black. Cool and massage the scalp well with the oil. Take fresh amaranth leaves and extract their juice. Apply this to hair. Massage the scalp with butter prepared from cow’s milk. Do it twice a week. The best herb for controlling graying of hair is the Indian gooseberries or amla. Dry the pieces of amla and put them in coconut oil. Apply this oil on hair. Alternatively. Take a teaspoonful of amla juice and mix it with some almond oil and lime juice. Apply this mixture to hair at night and leave it for the whole night. Wash hair in the morning. Do this regularly. Avoid white food stuff- refined flour (maida), sugar and potatoes. Also avoid soft drinks, spicy and fried food. Following the above tips on controlling graying hair will definitely help but they have to be regularly done for at least six months. Here are some more home remedies for premature graying of hair!